I’m starting to see fall creep into the stores this week. Pumpkin spice stuff is making a comeback. And, the leaves are starting to turn (at least where I live). Which means it’s a great time to start thinking about fall wedding cakes! And I love today’s featured cake. 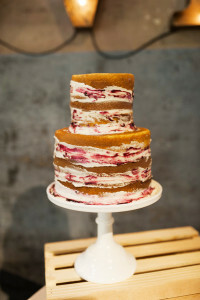 This naked confection has the perfect pop of fall color and would be lovely at any fall wedding. The white icing with red swirls are classic and elegant and whimsical at the same time. I’d love to see this cake at a holiday-time wedding too! And, thanks to the stunning look of the cake there’s no need for any additional embellishments. You can find this cake here. It was created by Sugar Bee Sweets.